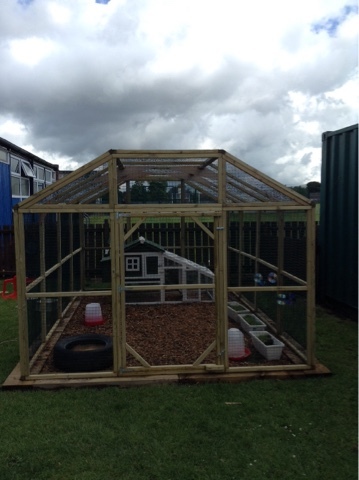 Wold Primary Academy Blog: F2 aviary for the chickens! We have enjoyed watching our fluffy chicks turn into feathery little chickens. Which means that they have nearly grown out of their house in the classroom. Before the holidays we all designed coops and runs for the chickens to live in. We knew it needed to be fox-proof to keep our chickens safe. Then we chose and ordered a special new house for the chickens to live in. Over the half term holiday their new house came. Yesterday morning we all helped set up their new home, making sure they had food, water, grass and somewhere to have a dust bath. 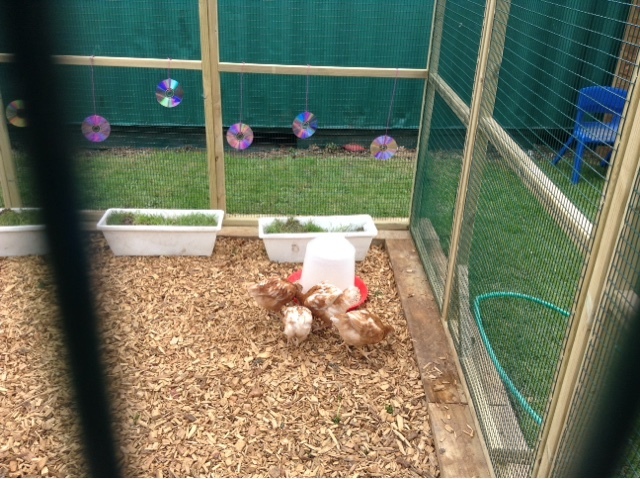 Then later on in the morning we introduced our chicks - Fluffy, Henny Penny, Buttercup and Daisy into their new home. They had a fantastic day pecking, scratching and flying around. We can't wait to see when they will lay their first eggs!